In Lesson 20 we visit a Spanish restaurant and order some food. Please note that lesson 20 of Season 1 was originally known as lesson 120 of Coffee Break Spanish. We have renumbered the lessons of each season as lessons 1-40 to make things more simple for our listeners. In lesson 19 we review everything you’ve learnt in lessons 11-18. Please note that lesson 19 of Season 1 was originally known as lesson 119 of Coffee Break Spanish. We have renumbered the lessons of each season as lessons 1-40 to make things more simple for our listeners. In lesson 18 you’ll learn more useful words and phrases for a visit to a restaurant. Please note that lesson 18 of Season 1 was originally known as lesson 118 of Coffee Break Spanish. We have renumbered the lessons of each season as lessons 1-40 to make things more simple for our listeners. In this week’s lesson you’ll learn useful words and phrases for a visit to a restaurant. Please note that lesson 17 of Season 1 was originally known as lesson 117 of Coffee Break Spanish. We have renumbered the lessons of each season as lessons 1-40 to make things more simple for our listeners. In lesson 16 you’ll learn more useful language for ordering drinks and snacks in the café or bar. Please note that lesson 16 of Season 1 was originally known as lesson 116 of Coffee Break Spanish. We have renumbered the lessons of each season as lessons 1-40 to make things more simple for our listeners. In lesson 15 you’ll visit a café and learn how to order some drinks. Please note that lesson 15 of Season 1 was originally known as lesson 115 of Coffee Break Spanish. We have renumbered the lessons of each season as lessons 1-40 to make things more simple for our listeners. Lesson 13 introduces some places in the town and helps you to understand and give basic directions. 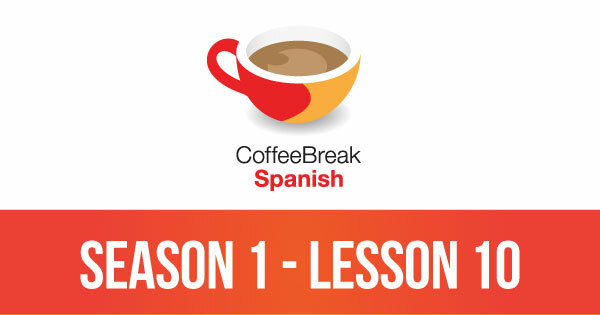 Please note that lesson 13 of Season 1 was originally known as lesson 113 of Coffee Break Spanish. We have renumbered the lessons of each season as lessons 1-40 to make things more simple for our listeners. Lesson 12 introduces numbers, days, months and seasons. Please note that lesson 12 of Season 1 was originally known as lesson 112 of Coffee Break Spanish. We have renumbered the lessons of each season as lessons 1-40 to make things more simple for our listeners. In lesson 9, you’ll review all the language you’ve learned so far in this course. Please note that lesson 9 of Season 1 was originally known as lesson 109 of Coffee Break Spanish. We have renumbered the lessons of each season as lessons 1-40 to make things more simple for our listeners. In lesson 8, you’ll learn to talk about your likes and dislikes. 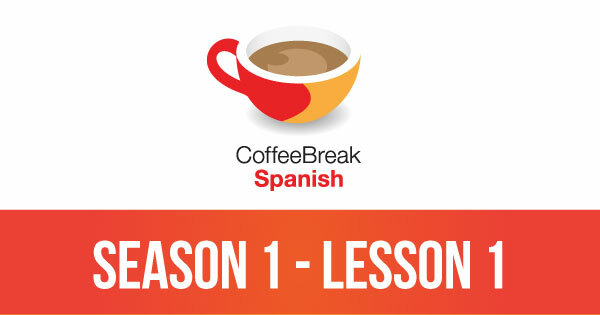 Please note that lesson 8 of Season 1 was originally known as lesson 108 of Coffee Break Spanish. We have renumbered the lessons of each season as lessons 1-40 to make things more simple for our listeners. In lesson 7, you’ll learn to talk about your job and whether or not you like it. Please note that lesson 7 of Season 1 was originally known as lesson 107 of Coffee Break Spanish. We have renumbered the lessons of each season as lessons 1-40 to make things more simple for our listeners. In lesson 6, you’ll learn to talk about your family and to count from one to ten. Please note that lesson 6 of Season 1 was originally known as lesson 106 of Coffee Break Spanish. We have renumbered the lessons of each season as lessons 1-40 to make things more simple for our listeners. In this week’s lesson, you’ll learn how to introduce members of your family. Please note that lesson 5 of Season 1 was originally known as lesson 105 of Coffee Break Spanish. We have renumbered the lessons of each season as lessons 1-40 to make things more simple for our listeners. In lesson 3, you’ll learn how to talk about where you come from. Please note that lesson 3 of Season 1 was originally known as lesson 103 of Coffee Break Spanish. We have renumbered the lessons of each season as lessons 1-40 to make things more simple for our listeners.